One of Chelsea’s new recruits has been quite vocal about regretting his transfer to the Blues this summer, CaughtOffside understands. Maurizio Sarri replaced Antonio Conte in the summer and brought in a number of new recruits, with Jorginho following him from Napoli, Mateo Kovacic joining on loan and Kepa Arrizabalaga replacing Thibaut Courtois in goal. Despite a strong start for all involved, things have fallen apart on the pitch for Chelsea in recent weeks, and this has seemingly led to players’ futures coming into doubt. Sarri’s tactics don’t seem to be rubbing off in the way they did at Napoli, with the Italian tactician also seemingly unwilling to change things around at all. CaughtOffside understands this has led to vocal complaints from one new player to the rest of the squad, which is doing morale no favours. It’s been reported by AS, as translated by Sport Witness, that several CFC players are already discussing potential summer exits with their agents if Sarri stays on as manager. It is not clear if the Chelsea player in question is going to stick around beyond this season, with CaughtOffside understanding the problems may go beyond Sarri and seem to be a general dismay at the running of things at Stamford Bridge. As well as uncertainty over Sarri’s future, Chelsea also face losing Eden Hazard at the end of the season as his contract saga rumbles on. On the pitch, a top four place now looks an increasingly uphill battle for the west London club, while winning silverware will also be tricky as they face City in the Carabao Cup final and Manchester United next in the FA Cup. 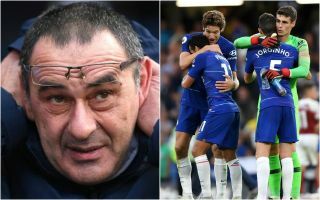 CaughtOffside understands this general lack of stability at Chelsea is making it hard for Sarri to lift players’ spirits at the moment as they look to arrest this shocking run of form on the road. Should Chelsea sack Maurizio Sarri?